Go Trent!. . 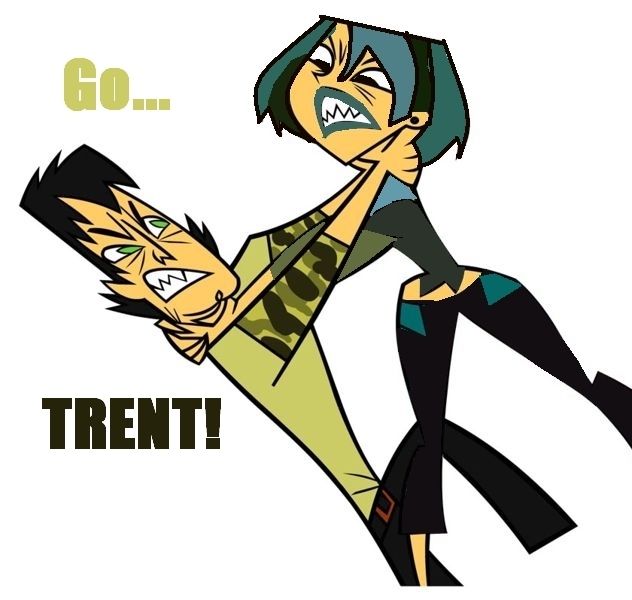 Wallpaper and background images in the Total Drama Island club tagged: trent gwen. i want to strangel Gwen and Trent to, after that. Ok, this is just not cool. Okay sorry,I feel bad now!I was just so mad about how the aftermath went and like how Trent would smile at Gwen and then she would just roll her eyes....RAH!But I'm slowly getting over it and I just want to say...well...I WAS A BAD,BAD GIRL!!! but, god this is coolio! In my vision, they're on that raft, then they go over and waterfall, and both die! God, that would make my day! wait a min, wasn't this from camp tv? This is from the camp tv art where they're strangling each other on the raft, hey, ask your sis if I cold make some editing to the words and put it in my album, k? LOL!! THAT GIRL WAS A STALKER!!! Like I said,my sister made it out of rage!! Actually in Camp TV (the promo series for TDI) Gwen and Trent strangle eachother like this. They were intended to hate eachother, and Gwen was supposed to have a crush on Geoff. Also, none of the charecters like Trent because he was "too normal" and Gwen was just a loner, not a Goth. I have other weird facts about the producers original intentions if you want! Anyone, just ask. Sister made it out of rage when she saw the 2 Afermath! oh remember gracie was all like"Sweet pickles thats good"! have u noticed that they have 5 fingers at camp TV but only 4 at TDI/TDA ?? I hate all the people who like trent,I mean it's his fault gwen broke up with.And tell your sister that wrong!!!!!!!!!!! why did your sister have to do something like that!I DON'T LIKE KILLING!!!!!! *says sarcasticly* If you don't like yelling then WHY ARE YOU YELLING?